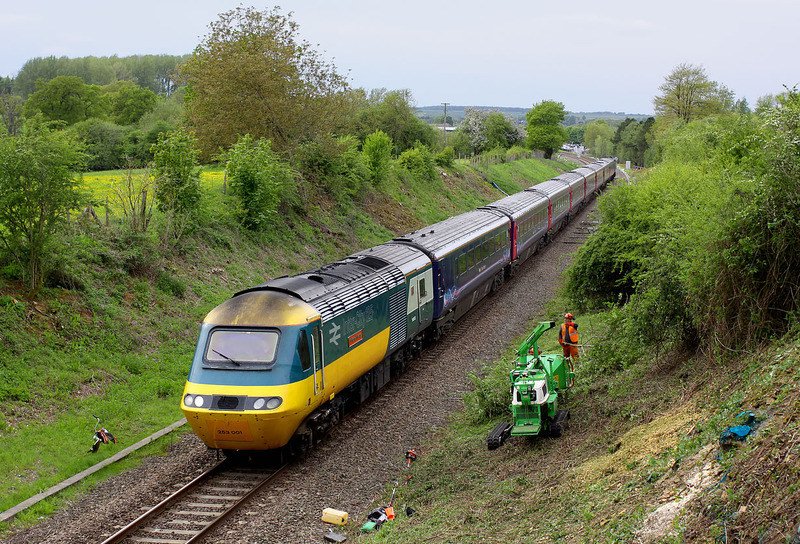 The Network Rail worker takes a break from feeding branches into the shredder, as 43002 Sir Kenneth Grange passes Cornbury Park on 9 May 2018 with the 1P40 17:38 Moreton-in-Marsh to Paddington GWR service. This is the only southbound train of the day not booked to call at Charlbury station. The station is just out of sight around the corner, and consequently this was travelling at some speed. Network Rail's massive vegetation clearance has come in for severe criticism, especially as it is taking place during the nesting season. Rather than routine maintenance, which was practiced until the 1980s, nothing at all was done on the Cotswold Line (and other locations) until the lineside got so bad that in many places the bushes were touching the train.